For her sophomore directorial effort, actress Veronica Ngo adapts The Story of Tam and Cam which is a Vietnamese version of Cinderella... until you realize there's more to it after the slipper fits and our heroine marries the king (demoted to prince-regent in the film). The poor girl is sent to death and reincarnated several times until she is back to being her old self (well, sort of) to exact a grisly revenge that involves boiling water and cannibalism on her wicked step-family. 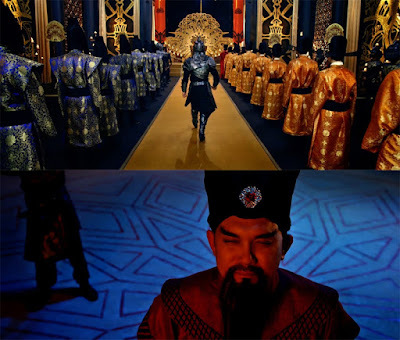 Staying as true as possible to the original tale and simultaneously toning down its grimness, Ngo weaves in some politics, martial arts and large-scale battles into the narrative and spices up the proceedings with the scheming Magistrate who's actually a demon in disguise. Oh, and she buffs the prince's role and gives him a few sidekicks in order to promote the members of the V-pop boyband 365 she produced at the time (they went on hiatus shortly after Tam Cam was released, notwithstanding its success at home). All of her commercial-wise slyness is matched by pretty solid helming skills and a keen sense of camp - she successfully juggles a number of subplots and tonal shifts, while portraying the vain femme fatale of a step-mother, Di Ghe, with unrestrained flamboyance. 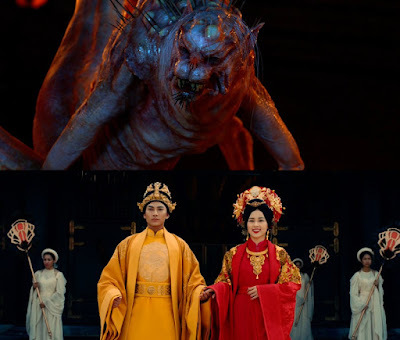 Sovereign as the antagonistic hussy, she finds her male counterpart in Huu Chau whose stylized eyebrows and evil laughter suggest that we're in the domain of fairy tale archetypes, so almost nothing should be taken too seriously. 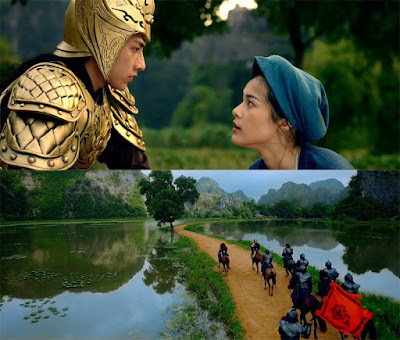 The rest of the cast also does a pretty good job, especially Ha Vi Pham debuting as the virtuous Tam and 365 singer Isaac as the prince Thai Tu who faces the loss of his beloved as well as the threat of war with the neighbouring kingdom. However, Tam Cam's strongest assets are its sumptuous visuals - the picturesque sets, the breathtaking vistas and the exuberant costumes - that make it fall somewhere between a Disney-esque fantasy, Yimou Zhang's spectacle and Mika Ninagawa's brightly colored drama. Even the CGI flourishes that look a bit cheesy or rather, video-game-y during the decisive battle between the Magistrate's true form and Thai Tu's inner beast keep your eyes wide open. Besides, the film's budget is about ninety times lower than that of Brannagh's 'reinvention' of Cinderella, yet it still looks amazing and provides more fun. Asking an artist to talk about his work is like asking a plant to discuss horticulture.